American Idol: television's answer for people who want to be discovered for a major recording contract but are consistently in the wrong hipster café at the wrong time. This show was a cultural phenomenon, starting with its first inception into our living rooms in 2002, all the way up to its eventual cancellation in 2016, giving average Joes and Josies a shot at fame and fortune, provided they could sing well and consistently. Okay, granted, you can probably only remember the names of one or two winners, but it was still a method of showcasing raw talent, provided you had any. If you didn't, the judges would assuredly let you know, including Simon Cowell, the most unforgiving entity for mediocrity able to be stuffed in a size -14 T-shirt. Capitalizing on the show's flume of popularity, a video game was dumped out within a year by Möbius Entertainment Ltd., a company known for such other Game Boy Advance heavy-hitters as Drome Racers and Barbie Horse Adventures: Wild Horse Rescue. You may know the company as something completely different now: Rockstar Leeds, who has co-developed many Grand Theft Auto games, including Vice City Stories and Grand Theft Auto V. But long before that, they were making this game, Americal Idol on Game Boy Advance, that shouldn't exist. You take on the role of a potential superstar and, after whipping together a fab look, customizing your hairstyle, skin colour, and top-notch outfit, you'll be facing the judges with your singing skills in Competition Mode. Up against the gritty appraisal of Paula Abdul, Randy Jackson, and Simon Cowell, you'll have to be the very best like no one ever was. 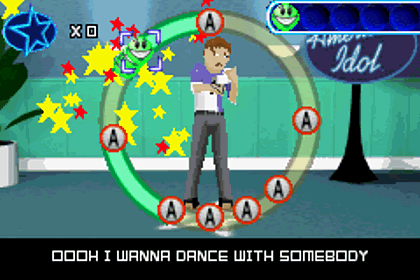 Unfortunately, that doesn't involve any ACTUAL singing — the Game Boy Advance won't allow for that! Instead, you have to watch a cursor zip around a circle and press indicated buttons around its circumference at just the right time, usually along with the beat or vocal rhythm. And that's how you're going to win American Idol and live the American dream. If you feel your button-pressing skills are inadequate, hop into Rehearsal Mode to hone your talents. Unfortunately, most songs are locked and will require you to practice other songs first. And if that's not enough, Endurance Mode will force you to see how long you could last, similar to an actual musical concert, as a thumbs-up/thumbs-down meter fills and drops based on your positive or negative performance. American Idol features twenty songs from various eras. Music by Madonna, N*Sync, The Beatles, Britney Spears, Kylie Minogue, Elvis Presley, and even the almighty Neil Diamond have found their place among the game's playlist. Even "A Moment Like This" from the first season's champion Kelly Clarkson is playable. But I don't think Whitney Houston's "I Wanna Dance With Somebody" has been butchered quite like this before, even in the dankest of karaoke bars. The songs are also significantly shortened, down to about a minute or so; if you really don't want to hear much more of "Escape" by Enrique Iglesias, fear not: it'll be over before you know it. I'll say this: Whoever recorded the actual vocal samples for the songs featured in this game would NEVER win American Idol. I think they just pulled a couple of random awkward teenagers out of algebra class to record these songs. Even if you think you're doing well — and you could be — the voices sound off-key, as if they just learned five minutes prior to recording what "singing" is. If you can't get the singing right in a game about singing, maybe you should seek other employment or just scrap the whole idea. Kidz Bop is slightly more competent than this. I have to say, I would complete Competition Mode over and over again just to see the squirmish renderings of the judges again. I mean, the rest of the game is passable, but these three look they were moulded in skin-coloured Jell-O. 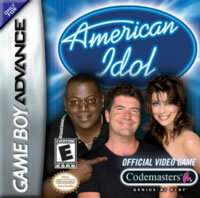 Randy Jackson's head is so misshapen, I think the console's processor may have melted him a little. That, or he left his neck in his other coat. It's pretty hilarious, actually. For a franchise dedicated to having a great voice and being able to sing with vigor and finesse in a live setting, American Idol on the Game Boy Advance makes little sense. It's a cash-in, plain and simple. The show isn't about pressing buttons while someone else sings; if it was that easy, Justin Guarini might still be relevant today.